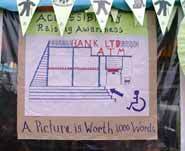 The ‘wheelchair children’ proudly represented their school in the parade. 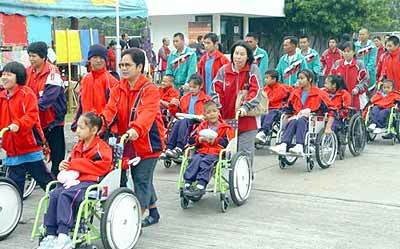 2000 handicapped children gathered at the School for the Development of the Child in Mae Rim for a day out during the National Day for the Handicapped December 23. 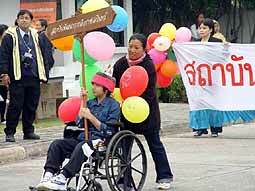 They represented many special schools and institutes in the North of Thailand. Listen to us and our needs! 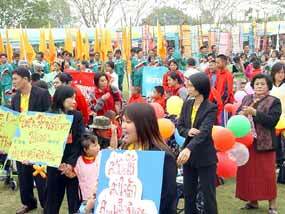 The schools for Blind Children, Deaf Children, Physically Handicapped Children, and Autistic Children took all part in a beautiful parade and held proud the banner of their school or institute. They played music, there were performances, and meanwhile the teachers and representatives of the students asked for awareness for the situation of handicapped children in Thailand, such as the difficulties children in wheelchairs encounter everyday because most buildings have no easy access for wheelchairs. It was a cold and foggy morning but all the children wore colorful clothes and the place was decorated with color full banners, flags and balloons. Teachers in thick winter clothes were busy setting the many tables for the lunch. their peers. Next year there should be more publicity for this event so that the people of Chiang Mai can come to visit and learn more about the often difficult situation of the handicapped children in the North of Thailand. This week’s column is practically a rewrite of last year’s column at this time. This is that time of year when we make all those resolutions that we have absolutely no intention of keeping, but it all sounded good at New Year parties! Well, that’s the truth, isn’t it? However there are a few resolutions that if you follow or abide by them you will get even more New Years to celebrate. Interested? You should be – I am offering you up to 10 more years, but like all great offers, there are some conditions that apply! The first resolution, for all cigarette smokers out there, is to give up the weed in 2006. It is no use trying to deny it. We have shown, more than adequately, that cigarettes are the greatest killers of mankind, even including Osama bin Laden. All smokers are on borrowed time. End of story. And I don’t care if your grandfather smoked 60 a day and lived to be 123. The big numbers that have been examined in studies all over the world say it all – smokers do not live as long as non-smokers. Smokers get all kinds of cancers much more than non-smokers, and that’s all kinds – not just lung cancers. Smokers get more heart attacks than non-smokers. Do you want me to go on? In the face of all the evidence, continuing smoking in 2006 is just plain dumb. So how do you give up? The best method remains your positive desire to give up and then go Cold Turkey. Forget the rest. The next resolution is very easy. Take 100 milligrams of aspirin every day. Once again, the big numbers prove the hypothesis. Your chances of having a heart attack are very much less by that simple expedient of 100 milligrams of aspirin a day. You can either buy 100 milligram tablets, such as Cardiprin, or take quarter of an ordinary 500 milligram aspirin tablet, which is 125 mgm. Close enough. Since you are what you eat, or so it is said, your next resolution should be to look at exactly what you do eat. Cut down on animal fats (where you get your cholesterol from) and increase your intake of fish is a good start. Eat ‘Asian’ twice a week, fish twice a week, and sensibly for the other three days. How’s the alcohol intake these days? Fuzzy heads in the morning? Then perhaps you should include alcohol reduction in your resolutions too. Four ‘standard’ drinks a day for men and two for women (sorry girls, but you don’t handle alcohol as well as we do)! Plus at least one AFD (alcohol free day) per week. What is a ‘standard’ drink? That is taken as 10 grams of alcohol - equal to one glass of full strength beer (285 mls), one small (100ml) glass of wine, or one measure (30ml) of spirits. One can of regular beer contains about one and half standard drinks, while a bottle of wine contains about seven. Happy New Year, and stay well in 2006. Thank you, on behalf of all the elves that work in the Editorial Office, for best wishes. Christmas was certainly merry, but I am baulking at this big word called “prosperous”. Does this mean I am going to have a change of occupation? The reason I ask is because I have yet to meet an Agony Aunt who owns a Mercedes or a designer home. For me, it is a life of hammering away on the keys and dreaming of knights in shining armor, weighed down with bottles of bubbly and boxes of chocolates. Perhaps I should be asking for donations of share certificates? Sawasdee Bee Mai to you too. I posted some Belgian chocolates to you today as promised, unlike that stingy Mr.Singha, I did keep my word. I hope they arrive safe and sound, the boxes are wrapped in foil so I hope they will be okay. Thanks for printing my letters to you. I’m Derrick, an Australian made in England, but who’s heart is 100 percent Thai. Thanks for your great column Hillary and I wish you and all at Chiangmai Mail a very Happy and Healthy Farrang New Year. Lotsaluv. I did thank you last week crossing my fingers that they would arrive, but I have now reprinted your letter to let you know the two boxes were delivered, in great shape, and were delightful. Thank you again. It is someone like you that gives everyone renewed hope in human nature! And in chocolates! I work in an office with ten Thai girls. Some people would think that is the greatest thing that could ever happen, but let me tell you it isn’t. I sit there at my desk while they chat and gossip and laugh at people. I reckon I would do twice as much work as all ten of them put together. Sometimes it is hard for me to get my work done too as they are so noisy, but their male supervisor, who is Thai too, just joins in the overall noise and never tells them to get back to their desks and do some work, but is very quick to tell me I’ve done something wrong. They also keep taking my pens and rulers and never put them back. What do you suggest, Hillary? You really have got a problem. You are totally outnumbered and it sounds as if your male buddy isn’t too worried about your worries either. Complaining isn’t going to get you anywhere. You have a couple of options. Move to another office, or if that isn’t possible, move to another employer. I can’t see any compromise situation that would work for you, I’m afraid. Best of luck, Charlie! I have been to Thailand a few times, so I know the ropes, or at least I think I do. I have never been one for the bar girls, and while I enjoy a drink and some company, I have never felt the need to take one home, if you know what I mean. Well, I went to a disco and met a young woman there and we clicked straight away. From there we went to a couple of bars and by the end of the evening we were a pair. I didn’t have much of my holiday left, but we managed to find accommodation in Koh Chang and we spent a wonderful week together. I’m back in the UK now and we have stayed in touch with emails and she is saying she wants me to come back over as soon as possible. I can see I am falling for this girl big time, but when I read all the problems guys have had in your column, I wonder if I should just give up now before I get too deep. She hasn’t asked for money, but it’s only been a couple of months. What’s my chances, Hillary? What’s your chances of what? Of being asked for money? Very high! What you have to remember is just how long have you known this wonderful girl, Wondering? It sounds like one week, at the end of a holiday, living on a tropical island. How close to reality is that? Not very is the answer. Would you do all this with a girl you met in a disco in Blackpool after one week? I don’t think so. Sure, keep in touch, but go slowly, Petal. Go slowly. Camera Class: Is this the ultimate digital? selblad has produced the Hasselblad 22 megapixel fully digital H2D which would have to be considered as having come close to the ultimate in digital photography. 22 megapixels! By the way, just in case you think that digital photography is something recent, October 7, 2005 marked the 30th anniversary of the digital camera. In 1975, the world’s first digital photograph was taken at a Kodak lab in Rochester, NY, USA, in an event that preceded the Compact Disc, the Personal Computer and the Internet. It was designed and built by Steven Sasson, an engineer at Kodak’s Applied Electronics Research Centre, and it weighed around four kilograms, and needed 16 AA batteries! And we have the gall to complain about the lithium-ion batteries of today! But back to the present. A year after the launch of the Hasselblad H1, the Swedish company has developed the H2 cross platform camera and the H2D fully-integrated digital camera. Both the cameras include a series of brand new features, and are fully compatible with Hasselblad’s existing H system lenses. The H2 and H2D cameras deliver improved mobility, quality, and workflow, say the manufacturers. This new camera features include a highly advanced image approval and selection tool, called Instant Approval Architecture providing a swift and easy way to select and classify images. Additionally, Hasselblad has built into the H2 cross-platform camera a new single-battery operation of the camera with the new Ixpress CFH digital back, offering one on/off switch and one operating system, facilitating streamlined, integrated operation. With existing digital backs already in the market, the H2 delivers the exact functionality of the H1. The digital Hasselblad results in much from the association with Imacon. measuring 37mm x 49mm. Coupled with an ultra bright, extra large ‘H-size’ viewfinder enabling better image composition, the final result is an image quality that exceeds normal expectations of medium format photography, which was already very high, hence the use of medium format professionally. by Hasselblad’s FlexColor workflow software is also available via importing the DNG file. The new FlexColor now allows the photographer to manipulate colour temperature and compare image details across multiple images for precise image selection. 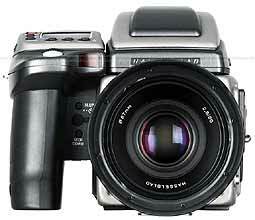 With this capability to have 22 megapixels in medium format, the Hasselblad is also joined by Mamiya and Pentax. With the advent of these, the film camera is now (unfortunately) dead and buried. what the New Year will bring. New jobs, new techology, a win on the lottery, new love....what ever it is, the New Year is a new beginning and before we lay the old year to rest, I have some interesting web sites I spotted during 2005 for you to look at. Did you know there is a web site dedicated to International Shoe Size Conversions? Considering the free-trade movement has made great progress and that shoes are a popular export item for many countries, it’s astounding that there are so many different shoe size standards. It makes shopping difficult, especially if you are picking up a pair while travelling abroad. This handy little web page aims to help you navigate the various standards to pick the shoes that fit best. I sometimes get the opportunity to browse news related web sites and being Australian, some of these are home grown. I came across a very interesting look at Islamic Terrorism since 2001 - produced by the famous ABC Australia’s Four Corners Program. From the time I learned to read, I have always had a fascination with Science Fiction. What I really do find fascinating now, is that its less Sci Fi and more Sci Fact. I sometimes visit the NASA web site and came across this little gem. “Near Earth Object Program”. In the next column, I have a few more Questions and Answers to share with you. Don’t forget to keep your preferred Anti-virus and Spy sweepers up to date. Do a full hard disc scan and sweep at least once a week. Don’t open e-mails with funny attachments if your not expecting them and last but not least, make sure your Firewall is on. Dr Byte appears in Chiang Mai Mail every 2 weeks and if you have any questions or suggestions you would like to make, you can contact me at Dr Byte, Chiang Mai Mail. Happy New Year to all. We saw in last week’s update that the potential power of the stock market is enormous. We also saw that this power can equally be used for good or for evil - wealth can be created or destroyed by both short term and long term fluctuations. It’s well known that the prices of stocks can go up or down and yet most equity investors ignore this. They stake their investment entirely on the principle that stocks will increase in value. Ultimately, over time, that’s probable. However, as anyone who invested from 1929 to 1983 can testify, the growth in the value of their portfolio (less than 1% per year) was much less than the rate of inflation over that time. Most folks say that they’re long term investors, but when 54 years isn’t long enough, you can understand why we tend to believe that long term investments are short term investments that people made which went wrong. This focus on just making money from stocks increasing in value is ubiquitous. Recently, The Seattle Times recently carried an article featuring the thoughts of Tom Muldowney, managing director of Savant Capital Management in Rockford, Illinois who firmly believes that you can reduce your portfolio expense ratio and also lower your portfolio risk by holding no-frills index funds. Muldowney’s argument was that index funds have a lower kurtosis (risk of total loss) than hedge funds and, therefore, are lower risk. This was a reaction to the recent rise in popularity of hedge funds due to their perceived lower risk and more consistent returns than investing in equities. Muldowney’s response is that index funds (which replicate the performance of an index such as the Dow Jones Industrial Average - less an annual management fee) are easier to understand and more accessible than hedge funds. We’ll evaluate the merits of hedge funds in the near future, but this perception of index funds worries us. Index funds represent a cheap and easy way to buy exposure to the growth of an index. They are an ideal way to trade in and out of a market for short term gain. For longer term investors they have the drawback that they don’t benefit from the dividend yield. The dividend is a variable annual discretionary payment to the shareholders as their share of the distributed profits the company has made. In the 1930s-1950s, when growth was around 3% per year, dividends added a further 2% per year income. Dividends waned in the 1990s with newer companies unable to pay them and TMT (telcoms, media, technology) companies argued that their money was better spent investing in the business or buying competitors. Dividends became relegated to “old economy” companies, or unfashionable industries, such as tobacco, which paid investors a premium to hold on to their stocks. However, four of the nine stocks in the Standard & Poor’s 500 that initiated dividends this year are in the tech sector. Legislative changes are helping to encourage dividend payments in the US. The tax treatment of dividends changed in 2003 when a 15 percent tax on dividends replaced the tax structure, in which dividends were taxed at the same rate as investors’ income. sity’s Stern School of Business found dividend payments grow when investors are willing to pay more for stocks with strong dividends and shrink when investors aren’t willing to pay more for stocks with strong dividends. So, investor behaviour could change corporate behaviour. However, the basic flaw of ETFs is that they do what they say they do - they replicate the index. So, while they might offer a convenient and speedy way to make short term tactical profits from the market, they still present the same problem as traditional long equity investment. In a falling market they fall just like the market does. They represent a mechanism for achieving cost-effective short term long exposure to a market. They’re not a methodology, merely a convenient cost-effective mechanism. They don’t reduce market risk or allow you to achieve neutrality (the ability to make money in rising or falling markets). They don’t allow investors to monitor or control risk or have any expectation of what returns should be, positive, negative or otherwise. Right now, we’d look to avoid them as we believe that the markets are approaching their inflexion point (they’re about to crash and burn horribly). Why do we think that? That’s getting us back to our favourite topic of whinging about the economy and we’ll slip that in under the pretext of equity investing next week. Life in the Laugh Lane: Happy You Near, Chiangmai! I’m not sure how many cities there are in America, but every one of them is way below Chiangmai on the list of desirable and stimulating places to live. Sure, you can complain about a few things here: traffic jams composed of people driving anything with wheels after drinking anything with alcohol, only three trash cans in the whole city, air pollution in January from hill tribes and farmers slashing and burning, or stunning women (Men? A bit of both in one body?) yelling “Bai nai? Bai nai? Want good time?” Next time you’re whining about Chiangmai, consider your options. You could try Bland. Dictionary says: “without any excitement, strong opinions, or special character.” Or Browse, though you can’t live there. You can only wander through, looking for nothing in particular. Depressed? Try Downer where you’ll need uppers to survive the downers. 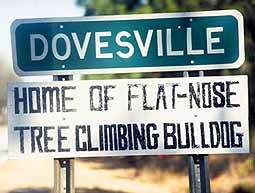 If “Home of Flat-Nose Tree Climbing Bulldog” is the best attraction they have to offer, I don’t want to live in Dovesville. Obviously the bulldog fell out of the tree too many times and landed on its nose. 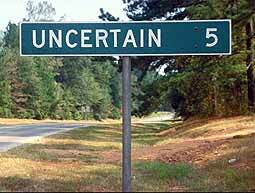 If you really can’t make up your mind, perhaps your destiny is Uncertain. At least the people from Peculiar know what they are and advertise their eccentricities. You could be stuck in Concrete. “I live in Concrete. It’s a hard life. 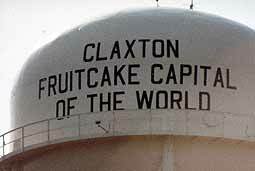 I met a construction worker, cemented the relationship, built a strong foundation and now we have a little sidewalk running around the house.” Claxton: Fruitcake Capital of the Entire World? Dictionary says a fruitcake is “someone who is mentally ill or behaves in a strange manner.” I’ll take Thailand any day.